In terrestrial ecosystems, tropic level plays an important role in food webs--that is, carnivores eat herbivores and herbivores eat plants. In the food webs of marine ecosystems, who eats whom depends largely on size. In many cases, adults of a small fish species eat the juveniles of a larger species, then the adults of the larger species eat the small species. The same occurs at smaller scales among copepod nauplii and adults. Food size is much more important than food species in marine environments. Most living things in the open ocean are microscopic. Phytoplankton photosynthesize food from sunlight. Microzooplankton eat the phytoplankton. Copepods eat the microzooplankton. Larval fish eat the copepods. Chaetognaths and comb jellies eat the smaller larval fish, while larval crabs and small juvenile fish eat the chaetognaths. Large fish eat small fish. Dolphins, sharks and sea birds eat large fish. Baleen whales and whale sharks, although very large, eat zooplankton. Algae grows on the under-surface of sea ice each spring as sunlight returns to the north pole. Bottom-dwelling invertebrates eat algae that has fallen off the ice and sunk to the bottom. Fish eat the invertebrates, and larger fish eat the smaller fish. Seals eat the large fish. Polar bears eat the seals. The individual coral polyps that build the reef play host to photosynthesizing algae called zooxanthellae. Coral polyps catch and eat small zooplankton in addition to benefiting from the algae. Small fish and bottom-dwelling invertebrates also eat the zooplankton, while larger fish eat the smaller fish and invertebrates. 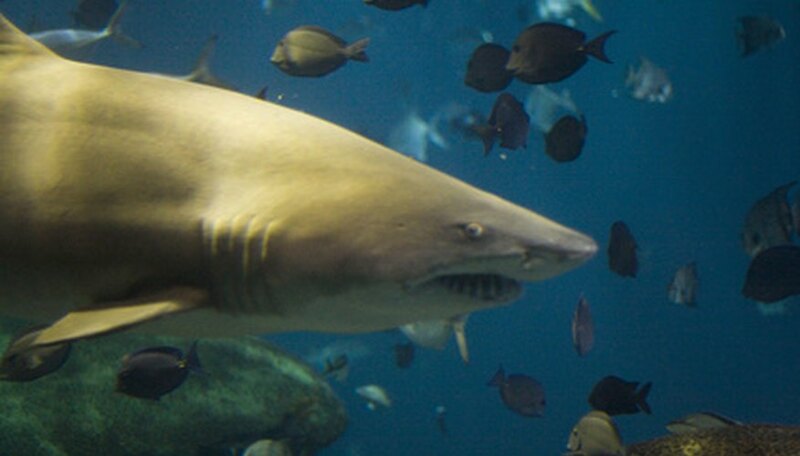 The largest predatory fish that count as resident reef fish are groupers, snappers and some species of sharks. 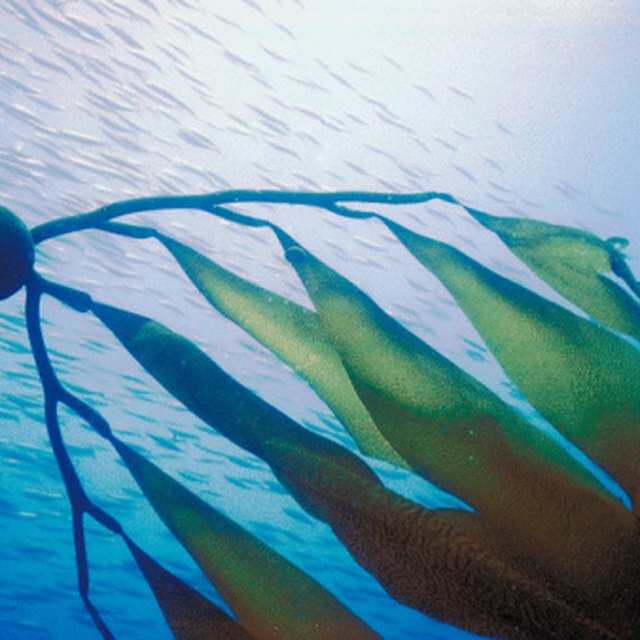 Kelp, a large seaweed, creates leafy underwater forests in coastal areas with cold, nutrient-rich water. Sea urchins eat kelp--and too many sea urchins can completely eliminate the kelp forest and many of the sea urchin predators that normally live in it. Sea otters eat sea urchins, keeping their populations low enough to allow kelp to grow. Orcas--killer whales--eat sea otters. Photosynthesis isn't possible at the bottom of the ocean, where light doesn't reach. However, undersea geysers called hydrothermal vents provide an array of minerals that chemosynthesizing bacteria can use as an alternate energy source. Tube worms, clams and mussels host the bacteria in exchange for some of the food. Shrimp and small crabs eat the bacteria. Octopi eat the clams, mussels and crabs, while large fish eat everything. Cole, Ryan. "Examples of Marine Food Chains." Sciencing, https://sciencing.com/examples-marine-food-chains-7148478.html. 24 April 2017.